How to Identify the New 100 Rupee note is Fake or Not? Home News Business How to Identify the New 100 Rupee note is Fake or Not? How to Identify the New 100 Rupee note is Fake or Not? This article reveals all the info via which you can differ between a real or a fake one. Have you seen the new 100 rupee note, moreover, if you ever encounter with any, how can you identify whether it is real or not? In India after demonetization of Rs 500 and Rs 1000 notes back in the Year 2016, Government also introduces several new notes. These notes are Rs 500, Rs 200, Rs 100, Rs 50 and Rs 10. However, the most recent note Indian government introduces is Rs 100. This new note comes in a beautiful lavender color and also have Rani Ki Vav image in the note back side. Note that Rani ki Vav is a UNESCO world heritage site in Gujarat. Okay, Enough of its intro let come forward to know about How to identify a valid 100 rupee note? One of the zeroes in the 100 digit of the new 100 rupee note is of Red Color. You will also find एक सौ रुपए written in the Red Color on the top of the note in the front section. In the front section 100 is written in Devanagari font i.e. १००. A Photo of Bapu i.e. 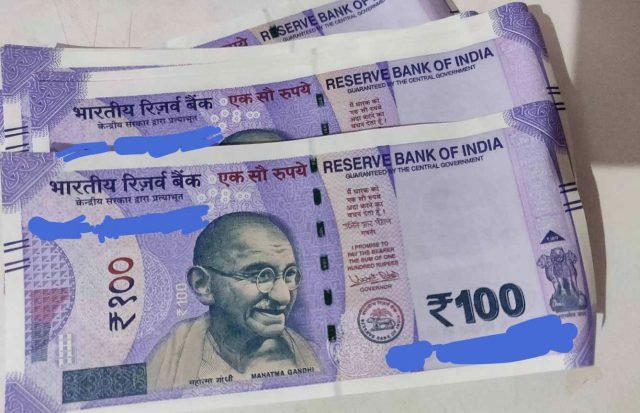 Mahatma Gandhi is printed at the center of this new note. Ashok emblem is present at the bottom right corner of the note. When you tilt this new note of Rs 100 the color of the thread of this new note changes from Blue to Green. At the left side slight at the top, you see the year of printing of the note. That’s it, Via this way you can identify a real or a Fake 100 Rupee note. Do let us know in the comment section below if you have any doubt or query. Read also: SBI Complaint Online Form: How to File any Complain About SBI? Next articleHow to Change Passenger Name in IRCTC E-Ticket?